While I think mint juleps in cupcake form are delicious, my first experience with the cocktail wasn’t as pleasant. To be fair, it was my first time making it so maybe I just picked a bad recipe, but based on what I’ve heard from other people, I think it was probably pretty close to the real thing. 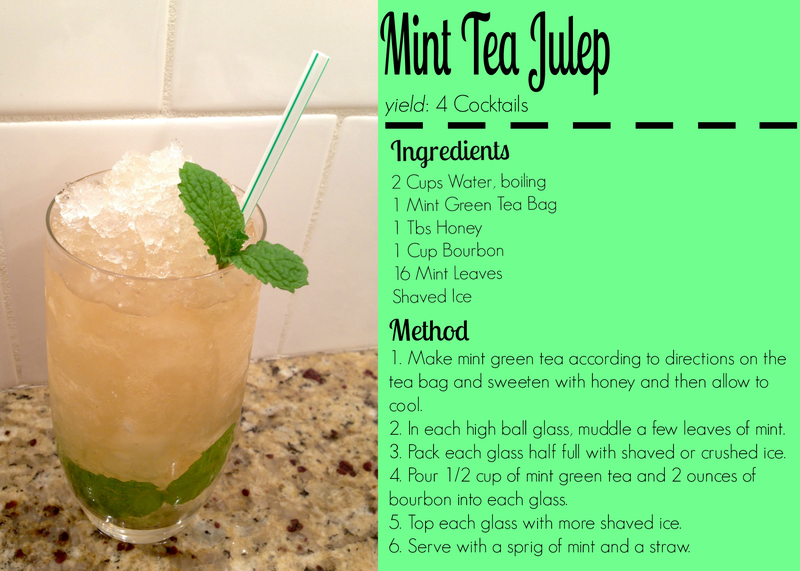 Since this is my first year really celebrating the Kentucky Derby, I want to do it right and so I decided I would just have to come up with a variation on the mint julep that I liked. As I was brainstorming, I realized that I still had some of the Mint Green Tea I had bought at Charleston Tea Plantation a few weeks ago. While we were there, I had tried an iced version that was sweetened. While I typically drink my tea with nothing added (except maybe ice if it’s a hot day), I figured a sweetened mint green tea would be the perfect substitute for the mint simple syrup. I brewed up a whole pot of tea and sweetened it with some tulepo honey from Savannah Bee Company. Now that I had my base figured out, I just needed to decide what ratios to use. 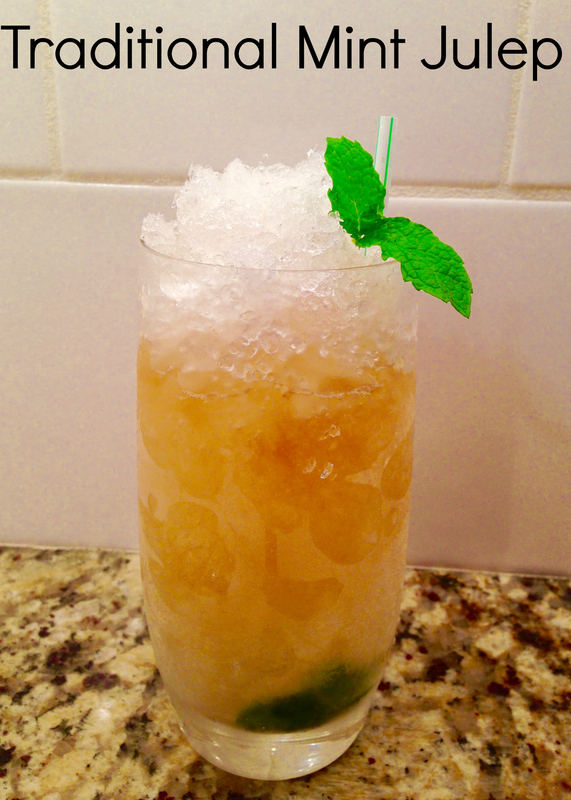 In the original mint julep, there is a lot of bourbon. Not being a huge bourbon fan, it was overwhelming and so I decided that my version would switch up the bourbon to sweetener ratio and let the tea play more of leading role. The results were surprisingly good. The tea, honey, mint, and bourbon all worked great together and I ended up with a very drinkable cocktail perfect for any hot day. Plus just like the original mint julep, it’s super easy to make up a pitcher of the tea base and just add the crushed ice and bourbon to order. This cocktail will definitely be the signature drink at my Kentucky Derby party. 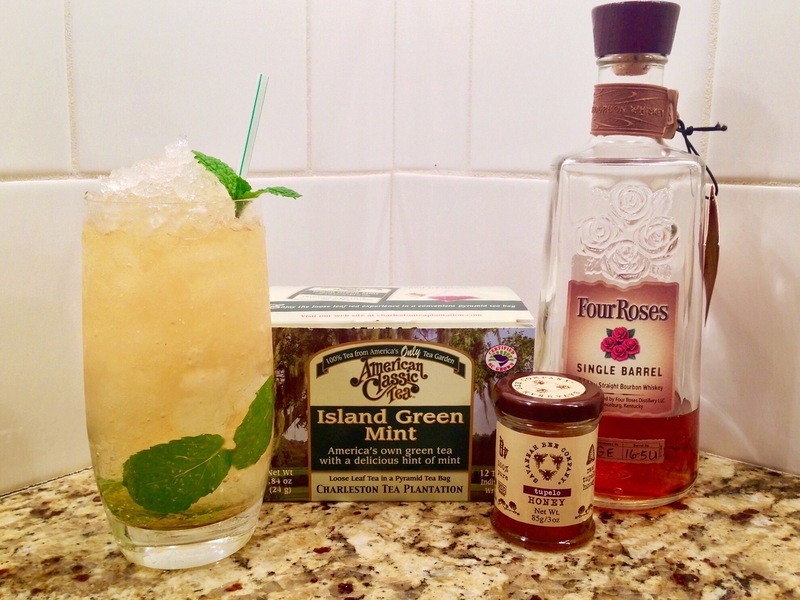 What’s your favorite cocktail for the Kentucky Derby?